Send them something original this Easter by giving them our Tempting Easter Cheese Delights Gourmet Gift Basket. 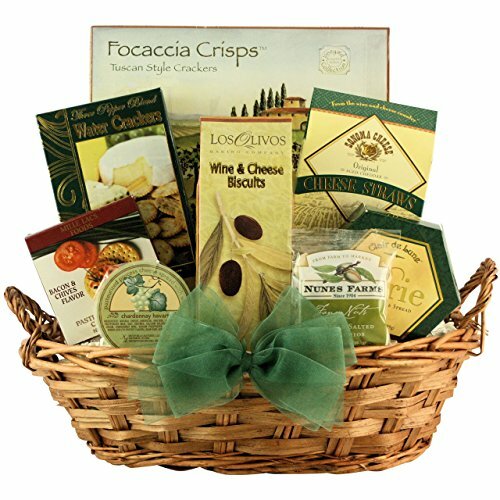 This basket features a nice selection of upscale flavored cheese spreads, crackers, pistachio nuts and other gourmet snacks. Features Brie Flavored Creamy Cheese Spread, Three Pepper Blend Water Crackers, Los Olivos Wine & Cheese Biscuits and more. The perfect gift to say Happy Easter this holiday. Send them something original this Easter by giving them our Tempting Easter Cheese Delights Gourmet Gift Basket. This basket features a nice selection of upscale flavored cheese spreads, crackers, pistachio nuts and other gourmet snacks. Features Brie Flavored Creamy Cheese Spread, Three Pepper Blend Water Crackers, Los Olivos Wine & Cheese Biscuits and more. The perfect gift to say Happy Easter this holiday.